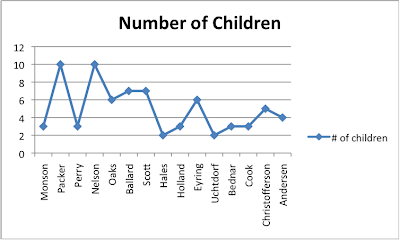 About five years ago I wrote a post looking at how many children the apostles of The Church of Jesus Christ of Latter-day Saints have. With the recent deaths of three apostles and the calling of three more in the past week, it’s time to update my analyses. Before I start I want to clarify that the number of children people have is not necessarily the number of children they want to have. I don’t want to downplay the heartache many feel at not being able to have (more) children due to health issues or other life circumstances. I pass no judgements on the number of children anyone has and ask that any who read this follow likewise. I’ll never forget a comment Truman Madsen made that when he was younger he and his wife would sometimes hear people ask behind their backs, “I wonder why the Madsens only have three children.” His poignant comment was, “We wonder too.” With this post I’m simply providing an analysis of things as they are. For those whose eyes glaze over at tables of numbers, here is a column graph of the apostles and the number of their children. The data are roughly normally distributed (skewness = 1.02, kurtosis = 1.34) so assumptions of normality are not violated and we can use parametric analyses. There is a moderate correlation between number of children and current age (Pearson r = 0.50, p = 0.057) but no correlation between number of children and age when called (r = 0.008). What does this mean? The older men tend to have more children than younger ones but the relationship is not associated with their calling as an apostle (it’s just an age association and not an age*apostle association). However, the correlation is largely driven by Pres. Nelson (10 children) – the oldest apostle – and Elder Renlund (1 child) – one of the youngest apostles. If they are removed from the analysis, there is no age/children relationship (r = 0.18). We cannot really exclude those two as outliers because I’ve sampled the entire population of apostles and such an exclusion would be misleading even if Pres. Nelson and Elder Renlund have a large influence on the relationship. How much of the number of children does age explains? Age explains 25% of the variance in number of children (R = 0.501, F = 4.363, p = 0.057), which is a moderate amount but it is obvious that age alone cannot account for the difference in number of children. There are other potentially testable factors (e.g., number of children in the apostles’ nuclear families, age at marriage, income, etc.) and untestable factors (e.g., personal choice or how many they physically could have) that might explain the difference but those are not addressed here. What about seniority, which is correlated with age, but is a different matter? I created two groups within the Apostles based on seniority (those called before 2000 and those after 2000); the 7 most senior (through Pres. Eyring) were one group and the 8 left were the other group (beginning with Pres. Uchtdorf). This group split is essentially a median split of seniority. A t-test revealed that there was not a significant difference in the number of children between groups (mean for group 1 = 5.29 (median = 6), mean for group 2 = 3.38 (median = 3.5), t = 1.70, p = 0.11, but the difference was a fairly large effect). This shows that the more senior apostles do, on average, have more children than the less senior ones but this difference is primarily driven by Pres. Nelson and Elder Renlund (this group difference is not significant with them removed from the analysis: p = 0.40). Now for something tangentially related. How old were the apostles when called? The figure below shows current age (blue) and age when called (red). What is interesting is that there is a trend towards a difference in age when called between the two groups (p = 0.07) with the more senior group called at slightly younger ages (mean = 54) than the less senior group (mean = 61). Pres. Monson, of course, is a strong driver of this difference (with him removed, p = 0.116) because he was ordained an apostle at age 36, which is incredibly young (he’s the outlier in the box plot below). Does any of this really mean anything? No. The Lord calls those He foreordained to the scared apostleship and who are ready to accept the calling, regardless of the number of children they have. However, it is interesting that younger apostles tend to have fewer children, which parallels but does not match the general trends in the world. Reanalysis: How Many Children do the Seventy Have? This post is an update of my previous analysis of the number of children of the seventy. The following table includes all 69 members of the 1st Quorum of the Seventy (as of 10/04/2013) sorted by age, youngest to oldest. You can click on a name to be taken to a short biographical sketch for each member of the Seventy. In order to start breaking down these data I think it is important to investigate some basic information about the numbers. First, the range of children is 1-12, meaning the fewest number of children is 1 and the most is 12. The total number of children of the 69 members of the Presidency of the Seventy and First Quorum of the Seventy is 361. This gives a mean number of children as 5.23 (s.d. = 1.85) with a median of 5 and a mode (most common number) of 5. Because all these values are basically the same, it is a good indicator that the distribution of the data is roughly normal. A quick calculation of the skewness and kurtosis reveals that this is the case: skewness = 0.80, kurtosis = 1.71. The data are “normal” enough to warrant further parametric analyses. For those who prefer graphical representations here’s a bar chart (click on it for a larger image) sorted differently than the table above with most senior Seventy (not necessarily the oldest) at the bottom. A number of children X seniority trend does not seem obvious. Now, sorting the Seventy by age yields a graph with what looks like an age X children interaction but before I start that analysis, I need to provide a little background information. There appear to be about two outliers (one Seventy with 1 child and one with 12 children). However, I will include them in the analyses because I have sampled the entire population of living, non-emeritus members of the First Quorum of the Seventy (and Presidency of the Seventy, who were all members of the First Quorum of Seventy before their calls to the Presidency) so removing a couple Seventy (3% of the sample) just because they might be outliers would be misleading about the distribution of the actual population (i.e., the sample is the entire population). Now back to the bar graph of the number of children of the Seventy when the Seventy are sorted by age. Now it looks like there might be a difference in the number of children between the oldest and youngest Seventies. When I correlated year born with year called as a member of the First Quorum of the Seventy, there was – no surprise – a significant (nonparametric) correlation (rho = 0.317, p=.008). This was run as nonparametric due to non-normality of distributions of year called. Because there is not a perfect correlation, the change to sorting by age rather than seniority seemed to make a qualitative difference. Now is there a quantitative difference in number of children between the oldest and youngest Seventies? There is a significant correlation between age and number of children (r = 0.44, p < 0.001). That’s quite a bit higher a correlation coefficient compared to the one I found a few years ago with my original analysis (r = 0.27). Here’s a scatter plot of age X # of children with the trend line shown. Now I’ll create two groups using a median current age split. The median current age is 60 years old. With this split there are 33 Seventies in the younger group and 36 in the older group (there was an even number of 60 year old Seventies so I put half into each group). Running an independent samples t-test yields a significant result (mean of younger group = 4.73, mean of older group = 5.69; t=-2.23, p = 0.03). Again, age seems to be a factor in the number of children that the Seventies have. When correlating number of children with how many years the Seventies have been a member of the First Quorum of the Seventy, there is a nonsignificant result (r = 0.02, p = 0.89). Therefore we can with some certainty rule out seniority (this just means age does not really enter in to when men are called into the First Quorum of the Seventy). Now is it just age? When we enter whether or not the member of the First Quorum of the Seventy was born in the U.S. (29/69 were born outside the U.S.), we see a significant group difference in number of children (t = -4.24, p < 0.001) with those born outside the U.S. having fewer children (mean = 4.24, s.d. = 1.19) than those who were born in the U.S. (mean = 5.95, s.d. 1.92). So the U.S. average is nearly 6 and the non-U.S. average is just over 4. Those born outside the U.S. are significantly younger than those born within the U.S. (t = -2.01, p = 0.05) with non-U.S. mean = 58.72 (s.d. = 5.52) and U.S. mean = 61.28 (s.d. = 4.96). To remove the effect of place of origin by splitting the Seventies into non-U.S. born and U.S. born I’ll run correlational analyses to see if the age X children relationship still exists. Within the non-U.S. born group it does (r = 0.42, p = 0.03). The same is true within the U.S.-born group (r = 0.39, p = 0.01). So age really has a significant relationship with number of children both within and without the U.S. (these results differ significantly from my analyses 3.5 years ago). What does this all mean? It means that as time goes by, younger members of the 1st Quorum of the Seventy are having fewer children (but they still have almost 5 children apiece). There is also the effect of whether or not a Seventy was born in the U.S. since those who were not born in the U.S. have fewer children than those born within the U.S. In any case, age seems to be the driving factor at this point (meaning younger have fewer children). This means within the leadership of the Church we see a similar downward trend in the number of children over time (but the Seventy still have many more children than is the norm in the world). Update: I’ve provided an updated analysis of the number of children of the Seventy. Read it here. This post is a follow-up post to my previous statistical analysis of the number of children of the living Apostles. At the time the post was hosted on Blogger; here’s the link at Blogspot as featured by the Mormon Times on April 9, 2010. Much of the information for this post comes from the Church News site with any missing information (the biographical info about the General Authorities is only current to 2008 at that site) coming directly from Ensign biographies of the new general authorities (e.g., this link) or Wikipedia (with verification from church sources). How many children do the members of the 1st Quorum of the Seventy (and Presidency of the Seventy) have? Excuse the long table but there are 62 members of the 1st Quorum of the Seventy (plus 7 members of the Presidency of the Seventy, who are also all members of the 1st Quorum of the Seventy). These data are sorted based on length of time as a member of the First Quorum of the Seventy (i.e., most experience to least). In order to start breaking down these data I think it is important to investigate some basic information about the numbers. First, the range of children is 1-12, meaning the fewest number of children is 1 and the most is 12. The total number of children of the 69 members of the Presidency of the Seventy and First Quorum of the Seventy is 360. This gives a mean number of children as 5.22 with a median value of 5 and a mode (most common number) of 5. Because all these values are basically the same, it is a good indicator that the distribution of the data is roughly normal. A quick calculation of the skewness and kurtosis reveals that this is the case: skewness = 0.69, kurtosis = 1.99. While the data are slightly leptokurtic, they are “normal” enough to warrant further analyses. For the Seventy, there does not seem to be a trend when sorted by seniority but what if we sort the Seventy by their current age and graph the number of children they have? There appear to be about three outliers (two Seventy with 1 child and one with 12 children). However, without running a formal “outlier analysis” of these, I cannot say for certain whether or not they are statistically significant outliers. In any case, I will include them in the analyses because I have sampled the entire population of living, non-emeritus members of the First Quorum of the Seventy (and Presidency of the Seventy, who were all members of the First Quorum of Seventy before their calls to the Presidency) so removing a few Seventy (nearly 5% of the sample) just because they might be outliers would be misleading about the distribution of the actual population. Now back to the bar graph of the number of children of the Seventy when the Seventy are sorted by age. Now it looks like there might be a difference in the number of children between the oldest and youngest Seventies. When I correlated year born with year called as a member of the First Quorum of the Seventy, there was – no surprise – a significant correlation (r = 0.652, p<.001). Because there is not a perfect correlation, the change to sorting by age rather than seniority seemed to make a qualitative difference. Now is there a quantitative difference in number of children between the oldest and youngest Seventies? Before I answer that, I want to point out that there is a restricted range in the ages of the Seventy. They attain emeritus status around the age 70, which makes the oldest possible active Seventy about age 70. With the Apostles, they never attain emeritus status until they die. What this means is the ages of the Seventy appear to have less variation than the ages of the Apostles do. But is there really a difference in the spread of ages? The mean age of the Apostles is 75.47 (st. dev = 9.68); the mean age of the Seventy is 58.90 (st. dev. = 6.78). The variation in Apostle’s ages (standard deviation) is about 13% of the mean age of the apostles and the standard deviation of the ages of the Seventies is 11.5%. That is not very different when presented that way; meaning that even though the range of ages of the Seventies is restricted “artificially” with a ceiling of 70, there is still a good amount of variation in ages. This variance in ages of the Seventy allows me to make a reasonable assumption that any results are not inflated by a restriction of range (although they could be but they could also be deflated by the restricted range). The R^2 value (variance) increased slightly. Now if I rerun the correlation (with N = 66) we receive an r = 0.31, p = 0.01. Removing the outliers improved the trend! I’ll keep all Seventy in all further analyses though. In either case, it appears that younger Seventies tend to have fewer children than older Seventies have. Now I’ll create two groups using a median current age split. The median current age is 58 years old. With this split there are 35 Seventies in the younger group and 34 in the older group. Running an independent samples t-test yields a non-significant but trending result (mean of younger group = 4.83, mean of older group = 5.62; t=-1.821, p = 0.07). Again, age seems to be a factor in the number of children that the Seventies have. When correlating number of children with how many years the Seventies have been a member of the First Quorum of the Seventy, there is a nonsignificant result (r = 0.04, p = 0.76). Therefore we can with some certainty rule out seniority. What do all these results mean, other than I am a bit of a statistics geek? We could surmise that the number of children that the General Authorities have seems to parallel the decreasing numbers seen worldwide, albeit very slowly. However, the average number of children of the current members of the First Quorum of the Seventy is 5, which is considerably higher than rates seen at present worldwide (although, that is not an entirely fair comparison because all/most of the Seventies are done having children – I’m just making an educated guess about that – so they are of a different generation than the current one(s) having children). However, members of the younger group of Seventy still have nearly 5 children on average. Are you convinced of age explaining the number of children? You might be pretty convinced about the link between age and number of children. I was pretty convinced by this point. However, when doing research or an analysis it is important to think of other things that might be explanations for the results you found. In other words, what might be another factor that affects the number of children the Seventy have? What about whether or not the Seventy were born in the United States of America? 40 of the 69 Seventy (58%) were born in the U.S. and 29 (42%) were not born in the U.S. I was surprised at how many of the Seventy are from different countries but it was a trend I noticed as the names of new General Authorities have been read in General Conference over the past few years. We are part of a growing worldwide church that has members in nearly all of the 200 or so nations of the world. When I correlated the number of children with my born in the U.S. or not variable, there was a significant result with the U.S. born Seventies having more children than those not born in the U.S. (r = -0.39, p = 0.001). An independent samples t-test confirms this result (mean of U.S. born = 5.83, mean of foreign born = 4.38; t = 3.50, p = 0.001). This result is still significant if I remove the 3 outliers (t = 3.79, p < 0.001). So is it age or place of birth? Here is a similar bar graph to ones presented before before but grouped by country of origin (U.S. / non-U.S.) and sorted by age (youngest to oldest). Notice any trends? First, I wonder if there is a link between birthplace and age. Maybe the youngest Seventies are more likely to not be born in the U.S. and that explains the results. Running a quick t-test yields the following result: mean of U.S. born = 60.20, mean of non-U.S. born = 57.10; p = 0.06. It appears there is a trend for the foreign born Seventy to be younger than their U.S. counterparts. Now, I will covary out where the Seventies were born in age and number of children analyses. A partial correlation (current age by number of children, controlling for place of birth) negates the significance of the results (r = 0.20, p = 0.11). An ANOVA (age by children) with place of birth as the covariate is also not significant (df = 23; F = 1.17, p = 0.32). This leaves the picture a bit hazy now. The number of children is not necessarily related to age, although it seems to be partially age-related, but it is not entirely explained by country of birth either (that only accounts for a proportion of total variance in number of children; plus, the foreign born Seventy tend to be younger than the U.S. born Seventy so place of birth results might be muddied by age differences). The number of children seems to be explained better by country of birth than age though. I’ll do an additional analysis to try and verify this. Looking at just the U.S. born Seventies, there is no longer a relationship between age and the number of children (r = 0.11, p = 0.49). This is also the case for the foreign born Seventies (r = -0.09, p = 0.64). This means that within the two place of birth groups, age does not appear to be a significant factor in the number of children. So where does this leave us? If we ignore country of origin, age seems to be a significant factor in the number of children (i.e., younger Seventies have fewer children, on average) but when we factor in country of origin (again, this is a binary classification – U.S. or non-U.S.), that relationship disappears. That means the number of children the Seventies have appears to be more of a country of origin effect than an age effect; however, we cannot completely rule out age. This is evident in that there is a trend for the foreign born Seventies to be younger than the U.S. born Seventies (mean of U.S. born = 60.20, mean of non-U.S. born = 57.10; p = 0.06). Anyway, country of origin is a significant factor but it is muddied by age differences. Clearly, there are a lot of other factors that I did not investigate that influence the number of children that General Authorities have. I hope you enjoyed this analysis. Let me know of any errors you might see or if you have any requests for further analyses. Please feel free to leave a comment and offer any opinions you might have.